Mixed Feelings Dazed Thoughts: House This!!! All these days I have been trying to take some time out to be able to pen down a few thoughts for my blog but the election fever in the state, A's posting to Odisha on Observer duty and my own transfer on the day he left meant little respite for days to follow. Little N has shown understanding well beyond her years (she's not even 14 months as I write this!) while Mamma discharges the election duty and stays away for hours on end. Once again as I find myself in complete solitude after the day's work and as little N sleeps peacefully after chasing peacocks all day, my thoughts wander back to the days when A was still in Tripura and I endlessly pursued a zillion hobbies to keep my hopes from fading and my energies creatively channelized. I had brought along with myself M-i-l's book EASY EMBROIDERY by Lis Paludan and had wanted to start on some work of my own too. The way her book is written, it seemed like a matter of patience and practice before even a novice could embark on embroidery project of sorts. 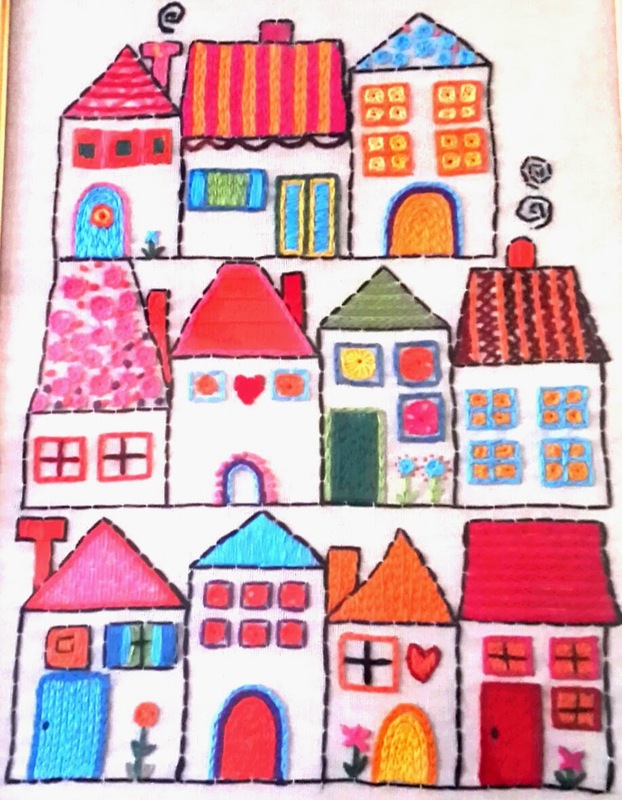 One of my two initial choices was the embroidered houses which seemed simple enough to begin with. During the recent visit to my parents' house in Delhi, as I looked at the houses I had made, I reminisced about the winter evenings I spent confined to my Agra house all by myself and doing embroidery for hours on end. My dear friend P made an interpretation of the same work too and if it were not for the countless happenings in her life these days, I could have showcased her work too. The work comprises of 11 houses stacked in three rows of 3-4-4 respectively. 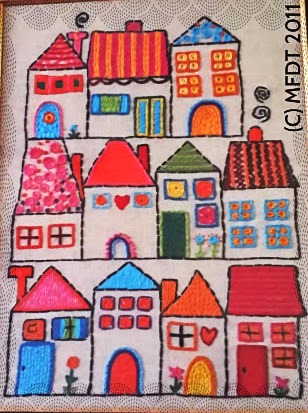 In the bottom row for example, the outline of the houses is done with black running stitch, the rooftops are done in pink asymmetrical running stitch, blue satin stitch, yellow chain stitch and dark pink and red chain stitches respectively from left to right. The doors are mostly in chain stitch while the daisy flower petals are done in french bullion knots. The marigold flower and the windows of the second house from left are done in buttonhole stitch. The middle row too comprises four houses done in outline black running stitch. 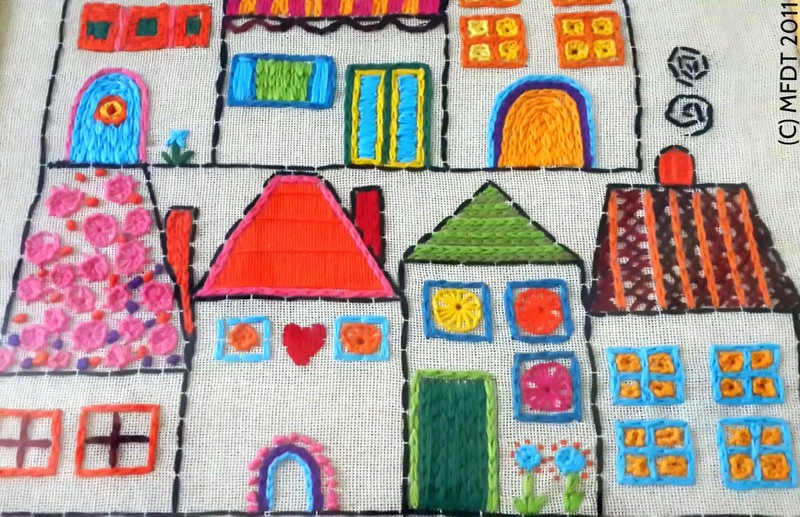 The roof of the first left house is done in a mix of buttonholes and french bullion knots while the windows are outlined by chain stitch in two colors. The chimneys of all the houses are done in chain stitch. The roof of second house has a double outline done in chain stitch and filled with satin stitch, windows are filled with buttonhole circles and double chain stitched door is adorned with french bullion knots. The third house from left is a classic example of chain stitch and buttonhole stitch while the herringbone roof of the last house lends a real touch to the depiction. 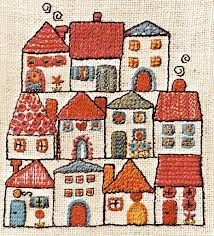 The three houses in the top row are largely a mixture of chain stitch and buttonhole stitch used in tandem. While I truly hope I have tried my best to preserve the beauty and color scheme of Lis Paludan's work,the unavailability of certain colors' threads and my own lack of discipline coupled with the fact that the project was completed in over six months in different cities with different states of mind, meant a melange of ideas on the fabric. The left panel is my work and the right is the original depiction as given in her book. I really hope my sister M loved her long promised gift when she saw this! I wonder how you manage to keep your hobbies alive with baby N and the busy schedule.. hats off to you! Thanks Avijit.. I really hope to be able to make something for little Shivi too before I leave.